Catch up with IABC San Diego members and fellow local communicators while sampling exceptional beers from one of San Diego’s premier local craft-beer breweries. Join us in the Tasting Room at Societe Brewery Company for a fun and relaxed evening on October 21, from 5:30 to 8 pm. Learn the story behind your favorite Societe brew – whether it’s the Butcher, the Pupil, the Apprentice or the Roustabout – when touring the 3000-square-foot barrel room. And for those thinking about becoming a member of IABC/San Diego, please read on to learn about special incentives for new members! Four 3-ounce samples from Societe Brewery’s collection of Out West hoppy ales, Belgian-inspired Old World brews, dark Stygian beers, and wine-barrel aged Feral sours. A tour of Societe’s climate-controlled brewhouse, where you’ll learn about the brewing process and equipment, and have the opportunity to ask questions. Delicious appetizers catered by Spanglish Eats, which combines the best of homestyle American and Latino cuisine. 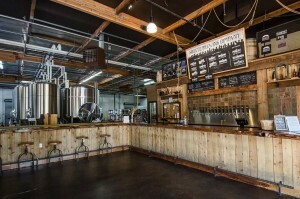 Societe Brewing Company is a production microbrewery founded in San Diego in 2012 by two professional brewers whose passion is perfecting their good ol’ fashioned house beers. Each tour group will be strictly limited to 12 people and will last approximately 30 minutes. Closed-toed shoes are recommended, but not required. Register today! Those joining IABC San Diego during the month of October will be able to attend either this month’s social or next month’s professional development luncheon (soon to be announced) for free. Once you have joined, you can attend this event for free by entering a promotional code*. What’s more, your enrollment fee of $40 will be waived, and you’ll also receive a 10% discount on your first year’s annual dues (see the IABC San Diego Membership Promotionspage for more information). Don’t delay – join today! This should be a great event to network and relax after busy day at work! I hope to see lot of my fellow communicators out there.